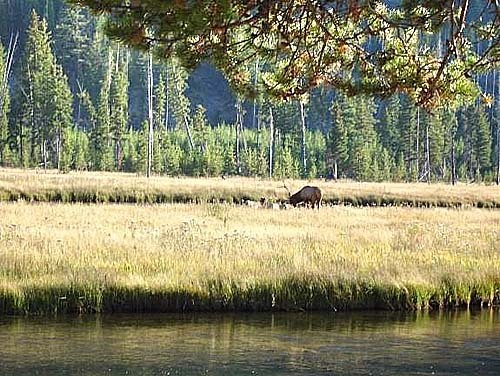 In early September 2008, John Files and I drove around Yellowstone National Park andended up fishing on the Gallatin, Madison, Lamar, and Fire Hole Rivers. We kept hearing that the fishing turns on at the end of September through November. We were a bit early. Blue Ribbon Flies, in West Yellowstone is a must stop for gear and advice. 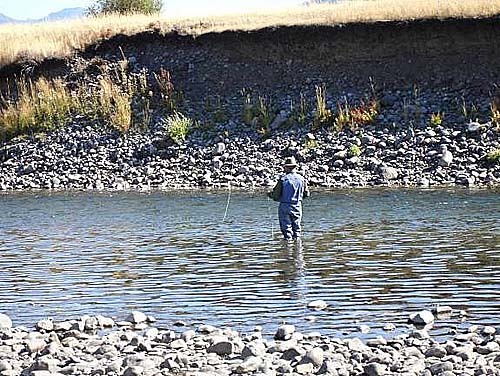 All Three shops there recommended April through Mid- May, and Mid –September to the end of October as the best times to fish this area. The days were warm, into the 70’s. The nights were below freezing. The night we camped by the Gallatin, the water pump froze solid by morning. The Gallatin River parallels the highway just north of West Yellowstone. We fished the morning near Bozeman, and caught a couple white fish. It was farm country. That evening, and the next morning we fished where the river descends toward West Yellowstone. Both John and I caught browns and bookies here from 11-13 inches. These fish took elk hair caddis dries and small nymphs. 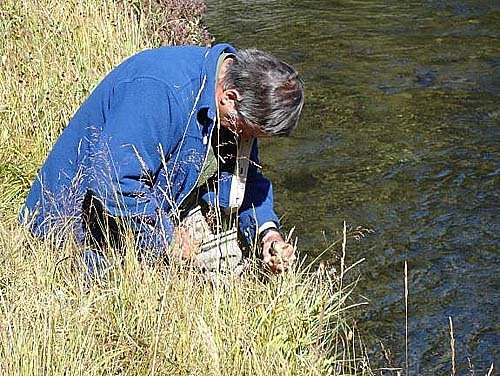 The best fishing seemed to be on a well oxygenated corner pool, below a riffle as it was low water year. 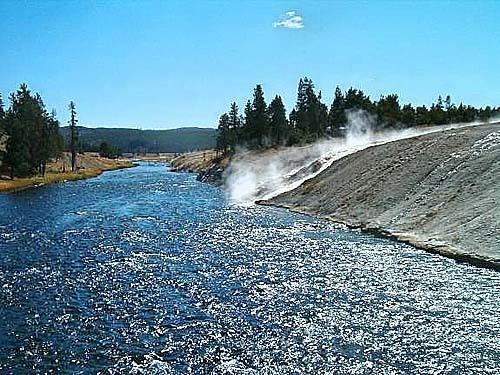 The river is right by the road from Bozeman to West Yellowstone. 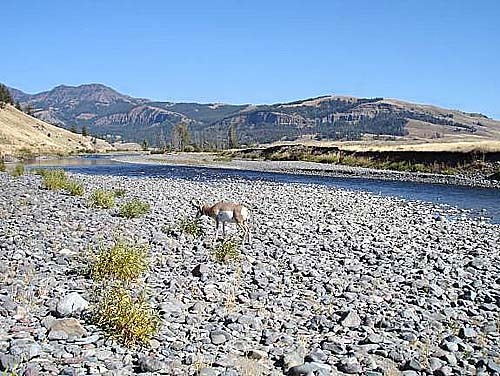 This is a river with easy access, and several campgrounds nearby. There are some small towns within 20-30 miles. We used the “Fly Fishing Montana” book as a guide. For me the highlight of our trip was fishing in Yellowstone National Park. 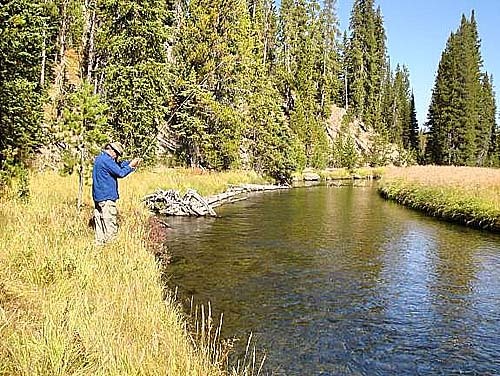 If you go, there is a good reference that we were referred to by a friendly local Fisherman: “The Yellowstone Fly Fishing Guide ” by Craig Mathews and Clayton Molinaro. 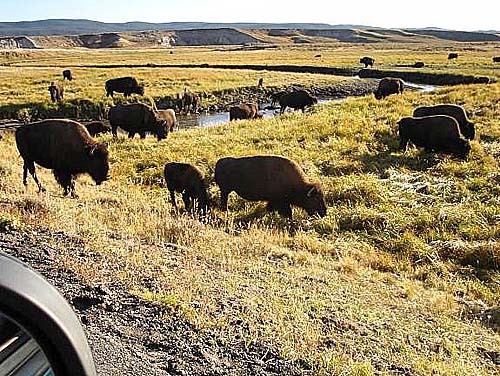 Buffalo Blocking the road near the Yellowstone river. This is high plains country. The buffalo crossed the road for 20 minutes, just to let us know they own the park. Both the buffalo and elk were rutting with lots of bugling calls. It is interesting fly fishing within a 100 yards of them. They were everywhere. We did not see any bears. The elk welcomed us to the Madison River. We fished the barn hole at dark. I had one fish on, but did not land him on a black woolly bugger. Other wise the fishing here was just like they did.. This run is known for being great when the browns migrate up out of Hebgen lake in early October. There was a broken penstock in the Hebgen Dam. The lower Madison below the lake was running as if it has the spring runoff. We caught a couple of white fish here. I have talked to some PFF members who fished it after the dam was fixed, and did quite well. Access is easy here. PBS ran a special on the wolf packs of the Lamar Valley. The valley runs maybe 20 miles in the NE corner of Yellowstone. The was a very dry year. There were herds of buffalo and Elk within maybe 50 yards of the river. They were noisy and ignored us. The road the river for the first 2 miles of the valley/canyon and then turns away. There are easy trails down to the river. 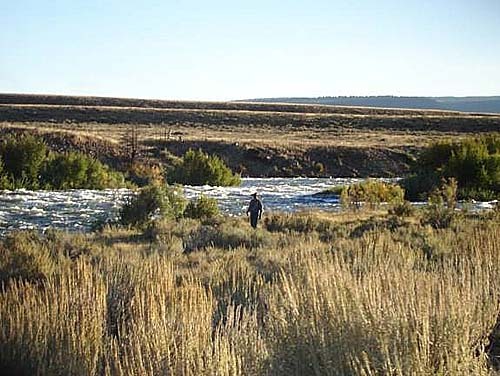 The river varied from 100 yards to � mi from the road. Hoppers were in the grass. I got one on a hopper, several others pushed the hopper pattern with their noses, and took off. When we moved up to a corner pool (pictured here), I added a #18, black midge, dropper. The hopper disappeared on the first drift. Working up the incoming riffle I caught a fish on every cast or 2. After maybe 15 or so, I called John on the radio to let him in on the secret dropper. The fish were 12-16 inches, and as I recall they were all rainbows here. This Pronghorn Antelope walked up to within 10 feet of me. I was thinking to get my wading stick ready if he charged. He turned away and started feeding in the local brush. Afterward he walked right across the river from where I had been fishing. We stopped at the fly shops in West Yellowstone. They recommended the upper Fire hole, above the Old Faithful Lodge area. It has a trail right along the river. This section of river could be in the Sierras by appearance. A Big old buffalo passed us on the way in. We each scooted to the other side of a gate while he passed. There were lots of small brookies. It was “fishing in the woods”. The lower section is supposed to turn on later in September. We spent the last afternoon in the park at the junction of the Madison, and Fire Hole river, taking a nap under a tree behind the visitors center. Tired, happy to be in this kind of outdoors, and mellow.